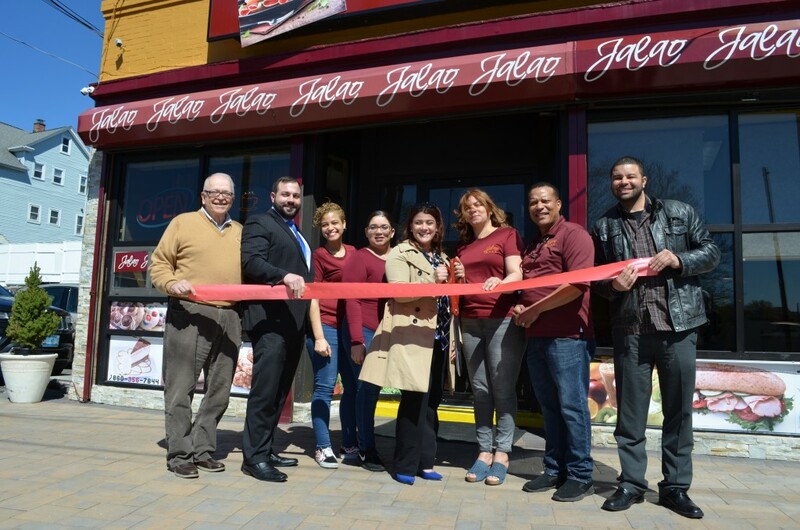 NEW BRITAIN – When Adalgiza Perez Suarez and Domingo Santos purchased Jalao Deli in 2016, the couple started to make small renovations to the business. They first purchased the business as a bodega where they sold some groceries and sandwiches. With the public’s demand for more food, Perez Suarez and Santos continued to make changes and stopped selling groceries. Tuesday was Jalao Deli’s grand reopening after being closed for a month as it transitioned into a restaurant. Mayor Erin Stewart, Alderman Kristian Rosado, Alderman Don Naples and members of the Greater New Britain Chamber of Commerce took part in the grand re-opening of the business and cut the ribbon to mark a new beginning. Jalao Deli and Restaurant, at 647 Stanley St., specializes in traditional Hispanic gastronomy. The owners are originally from the Dominican Republic and Jalao is an ethnic dessert made from coconut. Jalao Deli and Restaurant’s menu includes patacones, mofongo, picalonga, empanadas among other ethnic items. The business also sells wraps, sandwiches, salads and smoothies. Photos of the items offered in the menu are displayed on a screen. “We have a mix of sandwiches that are unique because like most restaurants, we have our secret ingredients in our kitchen,” Santos said. In addition, they have a daily menu of various hot items that customers can choose from depending on the day of the week. “I’m excited for Jalao Deli to put their business here on the East Side and it’s great to see another restaurant that encompasses the deep diversity that we have in the city of New Britain,” Rosado said. Santos said they are hoping to host activities with the community to maintain the business’ activism. “People can come and enjoy our outdoor dining as well,” Santos said. “We don’t have the sets out yet because it’s cold but next week they will be out there,” Perez Suarez added. Jalao Deli and Restaurant offers delivery Monday through Saturday from 11 a.m. until 4 p.m. Catering for special occasions is also available. The business is open Monday to Friday from 8 a.m. to 8 p.m. and Saturdays 8 a.m. to 7 p.m.
To learn more about Jalao Deli and Restaurant call 860-356-7844, 860-357-3518 or e-mail JalaoDeli@hotmail.com. This article originally appeared in the New Britain Herald on April 17, 2019.